Hello guys! Few months ago I decided to write simple application for those who are having issues trying to install Windows 7 on modern PCs/Laptops (not working mouse/keyboard , blue screens during installation and so on). This tool won't work with custom images containing both x86 and x64 versions! Make sure that you have more than 20 GiB of free space! Whole updating process may take even few hours! Yes .7z archive is huge because there are two windows 10 installers included (x86 and x64) and bunch of drivers! CSM must be enabled in BIOS! SECURE BOOT must be disabled in BIOS! USB ports won't work on Intel H370 , B360 and H310 chipsets! Use external PCI controller! Last edited by Atak_Snajpera; 17th Jul 2018 at 08:21. I tried running the above application on a system with an i5 CPU, 8GB RAM and an 1TB SATA3 HDD. I used an untouched ISO x64 image and an 8Mps Internet connection. The application run overnight for 12 hours and completed around 75%. No error messages appeared, but I had to abort to leave home for work. The "Whole updating process may take 1-2 hours!" statement above is simply not realistic. Yes it is realistic! On my system with SSD it only takes about an hour. Uncheck Apply to all editions and select specific edition you want to install. This should significantly reduce time. Better add this in the important notes too, but 12+ hours still seem a long time. To what size does the ISO image grow after applying to all editions? Last edited by kyrcy; 13th Oct 2017 at 13:05. As you can see you will need 8GB pendrive. Updating all editions took just over 18 hours to complete with a SATA3 7200RPM HDD. Last edited by kyrcy; 22nd Oct 2017 at 06:00. Can you please help me what am i doing wrong? I am having a bit of trouble with this tool...I have selected my ISO, which is straight from Microsoft, Windows 7 pro 64-bit with SP1, file name "x17-59186.iso". I have tried 4 or 5 different times and it always starts throwing errors and fails to install every single driver. Then it throws error #5, and exits. [2017-12-28 18:52:57] Installing 82 of 83 - C:\Windows 7 Professional\Windows_7_Image_Updater\Windows7\Driv ers\x64\Universal Serial Bus controllers\Intel USB 3.0 Driver\Win7\iusb3hub.inf: Error - An error occurred. The driver package could not be installed. [2017-12-28 18:52:57] For more information, check for log files in the <windir>\inf folder of the target image. [2017-12-28 18:52:57] Installing 83 of 83 - C:\Windows 7 Professional\Windows_7_Image_Updater\Windows7\Driv ers\x64\Universal Serial Bus controllers\Intel USB 3.0 Driver\Win7\iusb3xhc.inf: Error - An error occurred. 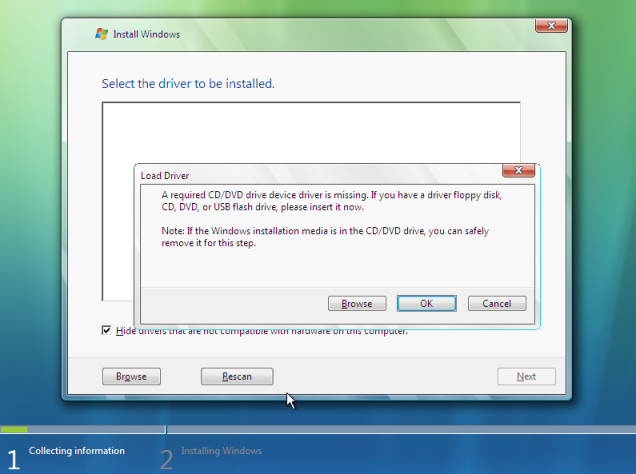 The driver package could not be installed. [2017-12-28 18:52:57] The command completed with errors. For more information, refer to the log file. Please first update your host OS (Windows 7 I assume). You are using outdated DISM. BTW. In few days I will update this tool with added new drivers. Last edited by Atak_Snajpera; 29th Dec 2017 at 05:45. I don't know that much about DSIM, so I searched for i and it was found in this folder: C:\Windows\SysWOW64\Dism. For DmiProvider.dll, mine is version 6.1.7601.23471, which I believe you said is the minimum that would work? Unless I am looking in the wrong folder? My host PC is Windows 7 Pro x64 with all of the latest downloads from Microsoft update, so I am not sure where to go to update this to a later version? Would trying a different PC work as you seem to think it is a host issue? Do you have enough free space on system partition (HDD/SSD) ? I have 16GB free on my system drive (C . I can make more if needed. I ran dism /? at a command prompt and it came up with a different version (6.1.7600.16385)....so it appears i have multiple versions of the dll. I am currently running a fresh windows 7 install on an older desktop so I will have a fresh install....will try to create images from there for my new coffee lake system.. When my tool is working observe free space on C:. I guess that 16GB may not be enough. thanks for doing this for Win 7!!!!!!! What security updates are included? Thx for update!! Question, what are the issues of installing Windows 7 on modern systems? I successfully ran Windows XP on a 2010 computer with no problems. But admittedly, M$ continued supporting XP until 2014 while they dropped support for Windows 7 this year. So say I do put my OS drive in a new rig. What would happen? And what does your tool do to make any difference? Will we still experience potential problems in the future? You say you add drivers but if they're not compatible with Windows 7 then how does that work smoothly? Lack of integrated USB3.0 drivers means not working keyboard and mouse in installer! Laptops for example do not have PS/2 ports at all! So there is no easy workaround. Another problem is with NVMe SSDs. Unpatched Windows7 won't recognize that drive! Do you really think that I'm that stupid to add drivers not designed for NT6.1 ???? Last edited by Atak_Snajpera; 2nd Jan 2018 at 05:54. But admittedly, M$ continued supporting XP until 2014 while they dropped support for Windows 7 this year. That's not correct. They're supporting Win7 until January 2020, they're just not testing the updates with CPUs newer than Skylake respectively Bulldozer/Piledriver. Intel and AMD aren't (officially) supporting Win7 on these CPUs, either. AMD aren't (officially) supporting Win7 on these CPUs, either. I really hope you keep this tool I development. I am planning a new build soon and this will be a huge help. Thx!! Nice work, Atak_Snajpera. I'm in, thanks! I will be trying soon...any new version coming? Two observations after testing the ISO image I created above: 1) The message to press a key to boot from DVD seems to appear for a second time while start booting and 2) A large number of new updates (700-800MB in size if I remember correctly) are still found after installation that seem too many. Wow, I know AMD backtracked on their statement with Ryzen support on Win7. Guess they are just publicly saying that but really doing the opposite. I'm ok with this. Skylake X and Kaby Lake X CPUs are available for purchase.